petition: End The Cycle of Puppy Mill Cruelty. Don't Support Stores That Sell Puppies. 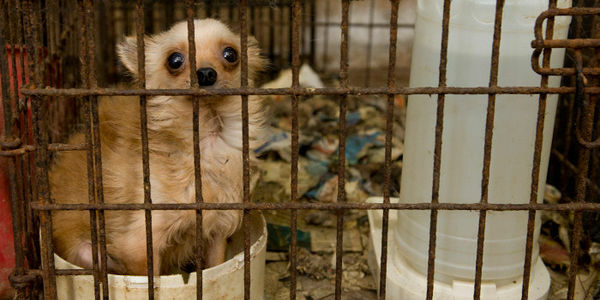 End The Cycle of Puppy Mill Cruelty. Don't Support Stores That Sell Puppies. The Humane Society of the United States' latest undercover investigation went inside a New York City pet store where the often sick and mistreated animals came directly from states known for puppy mills. In its hidden "back room" the animals suffered horribly from illnesses that went untreated and harsh handling at the hands of store employees. But this New York pet store is just the tip of the iceberg. The majority of pet stores that sell puppies are getting those dogs from puppy mills, which are dog-making factories where mother dogs spend their entire lives in cramped cages or kennels with little or no personal attention. When the mother and father dogs can no longer breed, they are discarded or killed. Due to poor sanitation and a lack of preventive veterinary care, the puppies from puppy mills are often sick. Sadly, consumers who purchase puppies from pet stores or online without seeing a breeder's home firsthand are often unknowingly supporting this cruel industry. You can all help end this cycle of cruelty by adopting your next pet from a shelter or rescue, or purchase only from a responsible breeder who will show you where your puppy was born and raised. Then, do even more by purchasing pet supplies from stores and websites that don't sell puppies. Where you spend your dollars makes a difference! Sign and pledge to adopt your next pet from a shelter, rescue, or responsible breeder and to support stores and websites that don't sell puppies.